Serving the Lake Travis area since 1999! Located in Lakeway, Texas, we are a full service hair salon and day spa with one goal—to make you feel special! Our beautiful, inviting facilities and highly experienced, friendly staff will help you Relax, Refresh, and Renew. Whether you spend an hour or a whole day with us, we want our spa to be your home. You always work hard for others and I would bet that you rarely take enough time out of your hectic schedule for yourself. 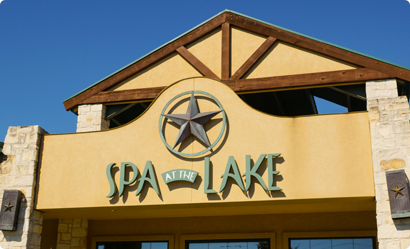 At Spa at the Lake, we want you to relax, unwind, and let us work hard for you. When you walk out of our door, I want you to feel truly transformed – physically, emotionally, or spiritually. My name is Melissa Cush, and I am the owner of Spa at the Lake. In 2005, I left Austin’s high-tech scene to join Spa at the Lake, where I realized I could have a profound impact on people’s lives. I brought much of my startup experience with me, including a core belief in great teams, great products, and great service. I believe that a happy team creates happy clients. We work hard to create a fun, positive, and constructive working environment. We hire only the very best team members who honestly love what they do, and they consistently deliver an outstanding level of quality service. And it shows in how long our team members stay with us — much longer than the industry norm. Your body, from head-to-toe, deserves the best products. There’s a huge difference between good products and great ones. That’s why we only carry the finest products available, with brands such as Kérastase, Skin Ceuticals, and jane iredale. And finally, we’ve built our business on word-of-mouth. You’re the reason we are here, and we want you to have the world’s best experience with us. You can see it reflected in our customer reviews. Come in today and let us treat you right!